Please note that we are closed until 22nd April. Daphne is a family run Turkish and Mediterranean Restaurant, based in a fine regency building where everything is prepared from scratch to ensure customers can enjoy a freshly cooked, tasty mixture of Turkish and Mediterranean cuisine with plenty of vegetarian options. Our restaurant has three floors (two floors can be used as private function rooms) that makes ideal venue for tailor made parties such as weddings, birthdays or corporate parties. Daphne Restaurant is the creation of Ilhan and Funda Bingol who have been developing and refining their menus and signature dishes over a number of years, aimed at pleasing all tastes and palates. Ilhan who was born in Istanbul, but has lived in Cheltenham about 22 years has been an enthusiastic chef with a massive catering experience at all levels. Ilhan also teaches Turkish and has been teaching at the local college and privately over 12 years. Funda, a primary school teacher, took an early retirement to join her husband Ilhan. She also has been passionate with cooking and taught by her grandmother how to cook at home in Bodrum when she was a young girl who inspired Funda to experiment with flavours and techniques. Funda has taken an advanced culinary class in Turkey, run by a famous Turkish chef to create delicious meals for their customers. 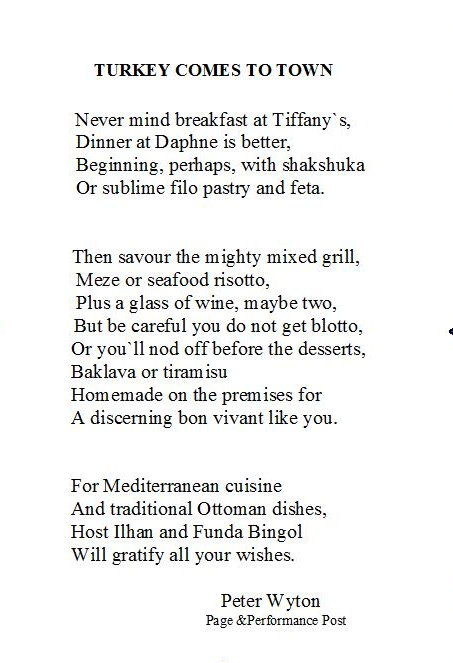 Ilhan and Funda are planning to run Turkish classes at Daphne’s in 2012 at different levels. No time to go to the Mediterranean this year? Come to Daphne Restaurant in Crescent Place, Cheltenham instead! The Daphne Restaurant has opened its doors to bring a wonderful mixture of Turkish and Mediterranean cooking to Cheltenham. LUNCH between 12:00 – 3:00 p.m.
Do you have special requests or allergies we need to be aware off? LUNCH 12:00 – 3:00 p.m.